We have been super busy working on different projects gearing up for the end of the summer enviroment fair. The second and third grade class have decided to give ourselves a room name. 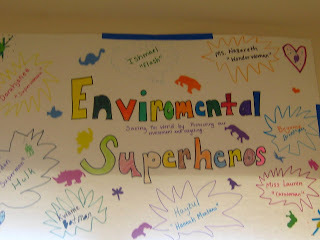 So we are now the "enviromental superheros". Superhero names included. The first picture was taken on monday when we got back from the waste water treatment plant. Our room decided to make a poster of the layout of the plant using q-tips and paint. Today we had a very eventful day. We had a guest speaker who came and spoke to the children about different types of trees and how they get water and nutrients. 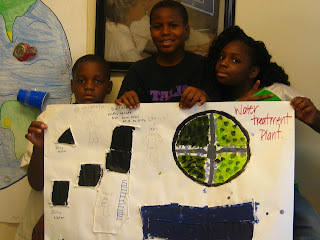 The kids learned alot about different trees in their own community. When we came back from Lunch the children decided to make posters showing a few of the things they have learned. We are not quite finished with them but the work they out into the posters is awesome. These kids have worked so hard.